From I-29, take exit 141 West onto US-2. In about 14 miles, turn right to the Cargo Gate (closed on weekends). Once through the gate, you'll be on Eielson St. Stay on this road and drive straight down to Outdoor Recreation to register, then continue to the end of the road which naturally turns right into the campground. May 1 - Oct 1. USPS: (Your name), c/o General Delivery, 590 Holzapple St., Grand Forks AFB, ND 58204 ---- UPS and FedEx can go to the MWR office. Allowed with the usual leash and cleanup rules. $4 discount with Golden Age/Senior Pass. Very peaceful and quiet campground. The area is quiet and secluded. One gentleman who worked at MWR told me that the campground was at one time a trailer park area which explained why some of the sewer and water hookups required an extension. Sadly, the base is not very active.The exchange food court was closed and the exchange itself was limited to one customer aside from us at noon. This is a small, out of the way place. It is quiet and friendly. The base is small too so if you need to go to the commissary or PX, its a short hop. The nearest population center, Grand Forks, is about 15 miles away. There is a Walmart closer. The biggest down side of the RV area is that the hook-ups are placed weird. There are only a few sites where you won't be challenged trying to hook up to everything. For me, the electric pedestal was a little tough. The sewer connections are smooth bore without a threaded end to secure the hose and there aren't any sand bags or even rocks or branches around to help. Overall, it is a nice little park and your choices in this area are few. The Outdoor Rec folks are pleasant and helpful. I didn't try the USPS General Delivery on base but I think that it is do-able. If you have pets, there is a tick problem. There are also mosquitoes when the wind is down. The contract lawn maintenance seems to come through once a week and they start a little early (8'ish). The laundry room and bathrooms are pretty good. Nice little Famcamp. Very clean. It was pretty deserted while we were here. Checked in at the Outdoor Rec office. Steve is very nice and was very helpful. They were just opening for the season and CE had not turned on the water in the showers and bathhouse but no big deal. Sites are big. Sites on the north have trees for shade. Some sites have the sewer hook-up on the wrong side so be sure and check. Otherwise it was a perfect place to stay and very easy to get to. MOSQUITOS!!!! The bugs were brutal - we could hardly be outside and outside was gorgeous! Paths, paved area in the famcamp - kids wanted to roller blade around the large area, park nearby but the BUGS were terrible. The famcamp was NOT sprayed for mosquitos, so we left with dozens of bites. HOWEVER, the location is good (a little far from everything, but doable), good laundry and book swap facility, nice base with all the amenities - good value, but the bugs kept us inside :( The campground itself was nice; agree with some that the setup is a little wonky with the hookups - having longer hoses is ideal. Good shaded areas, the sites along the main road backup to a sunflower field. Plenty of parking for your tow/toad/boat. Grand Forks doesn't offer a good deal of sightseeing, but provides a nice place to stay for a while and relax [if there are NO BUGS]!!!! Prices went up to 18 dollars a day. There is no WIFI or CATV. The camp is clean and well maintained. All spots are back in but lots of room. If you come here on the weekend you have to use the front gate. The tight snake turns makes it difficult but not impossible. We have a 44 ft 5th wheel and we fit. You go in the main gate and stay on that street until Eielson. St. Turn right and go to the end and turn right again. The camp will be in front of you. Spots are laid out for big rig then small, big then small in a staggered pattern. Very quite and peaceful. There is a walking/bike path in the camp. Nothing is open on the weekends. We will revisit. Stayed 2 nights on our way to Alsaka. Easy to get to with the instructions posted on this site. 50 amp and 30 amp was not working at our site, did not realize it until after setting up. Reported the problem to Outdoor Rec 4:00 pm and it was fixed early the next morning. The guy even gave me his shop number to call if I had an electrical problem again. Restrooms were very clean. There was a mother red fox with several pups next to the camp ground that we had fun watching. Only one other camper in the park when we were leaving. Stayed here 13 days. Very, very quite and relaxing. We have a 40 ft. 5th wheel and fit in easy. All sites back in. Had water, electric, & sewer hookups at our site. Yes, sewer hook-up took 20 ft. of hose, on wrong side of rv. Direct TV, Verizon cell & Internet worked great. Paid $16.00 per night. FamCamp is on base and would be easy to get to, if road work was finished. Check in is at the Outdoor Rec area building. Commissary @ Exchange close, but about 15 miles to town and other shopping, easy drive to get there. Washers 1.50 & dryers 1.00. I'm not a numbers rater, either I like a FamCamp or not. Well I like this FamCamp. Will stay here again. T.L. left this review using the Directory software: - I enjoyed my stay at grand forks. While here they were doing major repairs to Eielson St, so had to maneuver thru detour which made directions hard to follow. Other than being a little far from the city of Grand Forks, we enjoyed our stay here on the way to Alaska. The campground is in an old demolished housing area, so the hookups are a little strange. Where we were parked near the restrooms, I would have needed 30 ft of sewer hose to reach the connection from our 23 ft trailer. Fortunately we didn't need to dump at the site, and used the dump station on the way out. Everything else worked, good power, good cable, good water, etc. The WiFi was a little iffy, because the Barn Swallows had built a massive mud nest over the antenna. You could get a reliable signal by going inside the laundry, but watch for the bird droppings. The base facilities are good although not the biggest we have seen. Personnel at the Outdoor Rec office were very friendly and helpful. And, there is a very impressive display on the history of the base next to the commissary. I recommend you take a stroll around that. If we come this way again, we'll stay here again, although we did get a little tired of being jolted out of bed by Reveille each morning. The speakers are huge and very near the campground. I've reviewed this before, when the base was a large KC-135 refueling center. Under ACC and AMC, millions of dollars were spent updating and replacing much of ADC's and SAC's structures, remaining from the early days in the 50's and 60's. 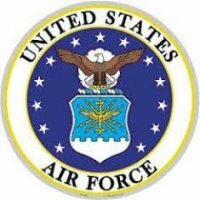 Within the last two to three years the mission of the base's 'owner', the 319th ABW, has changed from operating a major aircraft wing with wartime overseas missions occurring day in and day out to that of little more than a caretaker to the two tenant flying units, US Border Protection and ACC's Global Hawk drones. In 2000 there were 4,200 people on base, recent estimates are there now are about 2,000. That has resulted in far fewer operating hours for many services, including one of the newest and best equipped fitness centers (Olympic size pool, lap pool, squash/handball courts, and well over 100 various machines, as well as a huge free weight room), library, club, etc. Several years ago hundreds of new family quarters were built, some are occupied, many are not. Dormitories and VQ buildings are all new within the last ten years, yet the parking lots are about 1/4 full. Some unpaved walking trails and an excellent BMX trail, as well as family garden plots and a nature center are now abandoned and overgrown. The famcamp remains an excellent value, with full connections available to 21 spaces. The famcamp is on a huge parcel of land, and roads and sidewalks show that when first planned, there could be as many as 50 to 60 spaces. In the rare event that the full hookups are all taken, there are what amounts to a nearly unlimited number of places to dry camp, Not all electrical kiosks work, now do all the cable TV connections, although they are marked, and over the last couple years a lot of coax cable has been spread above ground to enable people to hookup in the event their pedestals no longer work. The laundry is clean, and men's latrine needed new toilet paper (which we supplied), but the heat worked and the showers were excellent and hot! Still just $12 a night, or $6 with Golden Eagle pass. Clearly maintenance has been reduced, you are on your own in many ways, but it is a GREAT place to stay without being hassled or bothered. Commissary small but very nice. BX OK too. 15 miles to downtown Grand Forks. This is our third time here, as well as several times without camping, staying in quarters. VERY clean and tidy base. Our first time at this famcamp and we love it. The girls at Outdoor Rec were very friendly and extremely helpful. This is a famcamp that doesn't hand you a list of rules and regs. They are more concerned with the customer than with keeping the grass green. Just come and relax. We just wish this base was closer to Oregon so we could visit more frequently. I reviewed this CG before and it was a good review. An update is that now they have WiFi, in fact, I am posting this review from our campsite. They also have cable for TV and the grass did not need cutting this time. All in all, a very nice campground. 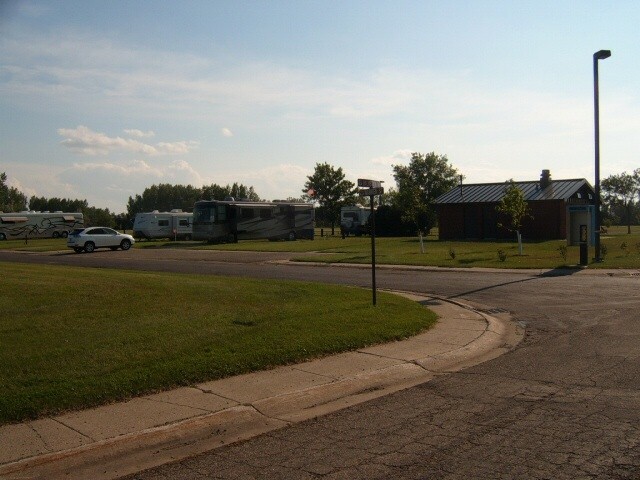 The Famcamp is in a nice location on base and the facilities were clean. It did not have WiFi. They will accept National Park Access Pass. GFAFB FamCamp is a very good value. For $12/night ($6) if you have a Golden Age Pass, it is very much worth it. We arrived when it was relatively full and had to park in an open area with no shade. We moved to a shaded area after a couple of days and it was very nice. The bug sprayers still drive around once a week. Good note on bringing longer cords an sewer hoses. The shaded areas have full hookups, but they are on the (PS) wrong side. Facilities (laundry and restrooms/showers) are very clean. They get serviced every day. Outdoor Rec staff friendly helpful and responsive. Campsites are level, some have campfire rings, some with and with/out shade. Maintenance on the FamCamp is sketchy. The grass gets cut weekly but 2 campsites have water leaks and the base has corrected it after two attempts. The pavement is needing repair because large trucks go through the area from one side of the base to the other. Road repair doesn't seem likely. Not sure about the future of the base. The air planes left in Dec 2010 and the rumor is the the UAV wing is ramping up to go operational with in the next year. Meanwhile, on base housing is being emptied in the older sections. All in all - it worked fine for us. The base commissary and BX are small but adequate and they have a nice 9 hole golf course. We camped in a 40' motor home and would do it again. Nice park and the price is the best value for any military campground. With the Golden Passport or Golden Access Pass the daily rate is reduced from $12.00/night to $6.00 night. Access through the Cargo Gate is tricky on the weekends. The Cargo Gate is closed on Saturday and Sunday and is probably closed after working hours. I had to call the base info, who in turn transferred me to base security. I had to wait 20 minutes for someone to open the cargo gate. And then I went through a canine inspection. I would not recommend trying the main gate with a big rig! Showers are clean, campground is clean, the clerks at Outdoor Recreation are friendly but clueless (did not know who emptied the washers/dryers of quarters). They did not have enough change for $10.00 worth of quarters. Mosquitoes are terrible this time of year but they do spray at least once a week. I would have rated the park higher if it had wi-fi and cable TV. I was able to pick up NBC, ABC, CBS and PBS with an antenna (and digital TV). G.L. left this review using the Directory software: Lots of ticks and mosquitoes this time of year. C130 sprayed the base one afternoon, how's that for service. Southern Saskatchewan and North Dakota having lots of flood problems. 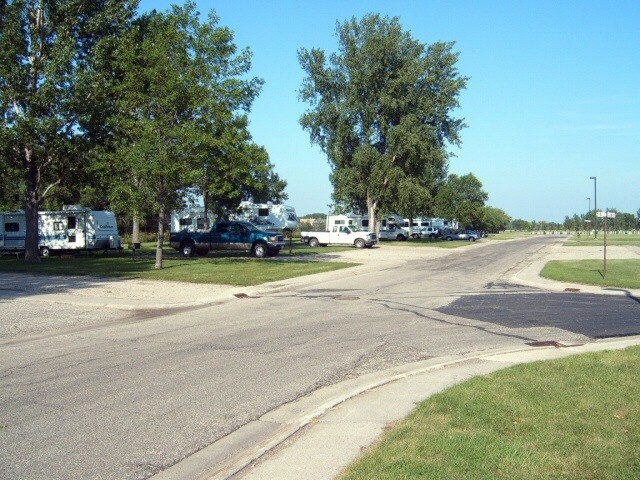 The campground is an old housing area, quiet. Great place to stay. Choice of trees or open area. 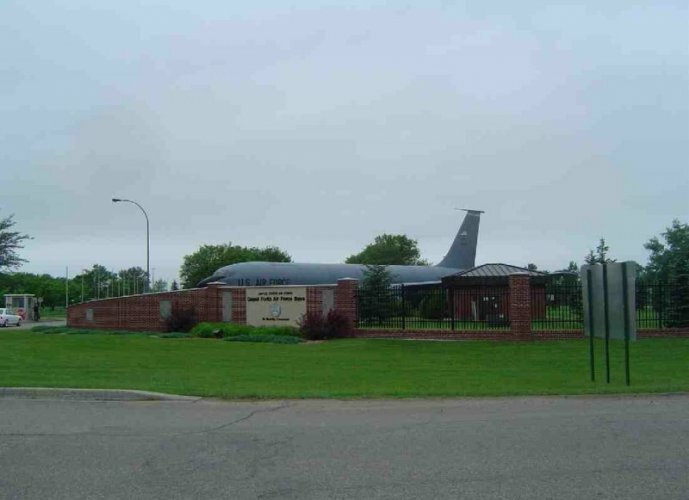 Grand Forks AFB has a great FamCamp and the price is definitely great. However there has been a recent change on how to enter the base in an RV. The directions above sent you to the Main Gate of the base, but now you must go to the Cargo Gate which is 1-1/2 miles further west on Hwy 2. When through the Cargo Gate, you will be on Eielson St which is a straight through drive to Outdoor Rec (on the right) and then after registering continue on to the FamCamp. Outstanding facilities in all respects; even had mosquito spray truck servicing camping area. Entire Outdoor Recreation Dept staff most courteous, friendly, and helpful.....even giving cafe recommendation for upcoming visit to geographical center of North Mmerica in Rugby ND. Definitely stop there next trip in area. L.O. left this review using the Directory software: This base rec. area is very clean, open, BX is being updated, we will stop there often as our G-son is going to UND.... very happy with campground.